meets your requirements: case: robust, large, stable and secure with lid brake. protects your health: Wiha pliers require less force and reduce pressure on wrists. Ergonomic handle design makes work easier and prevents occupational illnesses. Trolley with stable in-line rollers allow easy and stress-free transportation of tools to the work area. increases your safety: internationally award-winning VDE-insulated tools, each individually tested at 10,000 VAC and approved for use at 1,000 VAC. Gas-filled shock absorbers hold the lid in all positions and reduce the risk of injury when closing. increases your efficiency: a comprehensive tool assortment, always having the right tool at hand when needed. The design and function of the tool trays guarantee quick and easy access to tools. application: suitable for working on live parts up to 1,000 VAC. 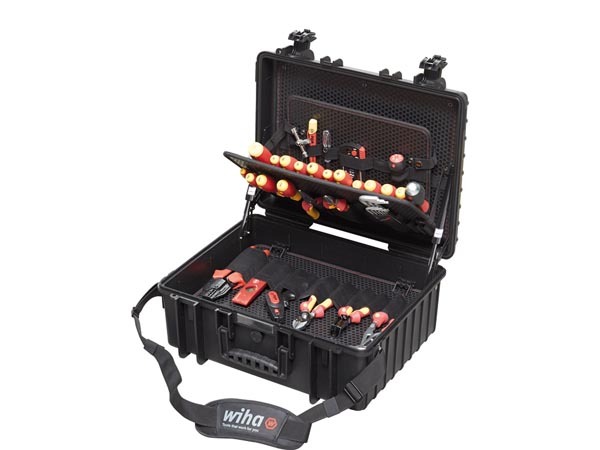 The complete kit for professional electricians out on jobs.